Cakes are a symbol of decadence and celebration around the world. They come in endless shapes, varieties, and flavors. Perhaps the most indulgent cake of all is the ice cream cake. Despite the additional challenges of working with frozen material, decorating Ice cream cakes is a snap. Freeze your ice cream cake. Once the cake is put together, the cake should be put in a freezer or otherwise frozen environment for at least three hours. The long freeze will ensure the cake will hold together during decoration. Pay attention to how long the cake has been out of the freezer when decorating. It should never be out of the freezer for more than 30 minutes. Select a decoration theme for your ice cream cake. Holidays make for an easy unifying theme for colors and images. Birthday ice cream cakes can be organized around classic party themes, favorite hobbies, or other interests. Sporting events can be celebrated with a simple ball or field designed ice cream cake. Choose a suitable frosting for a frozen cake. 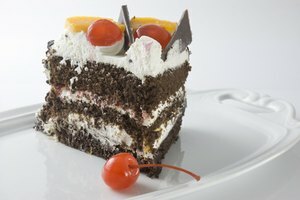 Some cake frostings will not freeze well and tend to crack and break at low temperatures, which will mar your ice cream cake. Use an easily malleable frosting material like buttercream or stabilized whipped cream topping. Stabilized whipped cream can readily be purchased at the store or made at home by combining 1 tablespoon of cornstarch per cup of whole cream and whipping until fluffy. Spread the frosting in a thin layer over the cake and freeze it again. Use cake decorating equipment to put it all together. Use shaped tips and a piping bag to add edges and a message to the cake. 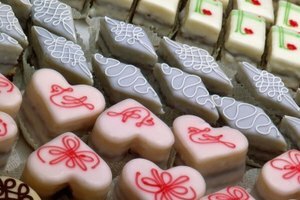 Mold fondant or gum paste into desired shapes using a precision razor or preshaped molds. Dye frosting to appropriate colors using a food-grade airbrush. Integrate other goodies into your cake design. Use chocolate squares for bricks or tiles. Crush cookies and use the crumbs to simulate soil for gummy worms to live in. Colorful candy pieces or gummy candy pieces can be the valuable gems in a mining pile made of crushed nuts. Work with the cake in as cool an environment as possible. Freeze cake as often as needed between decorating phases.